Rocktober! Day 11 | Awesomeness For Awesome's Sake. You guys remember S.O.D. don’t you? No? 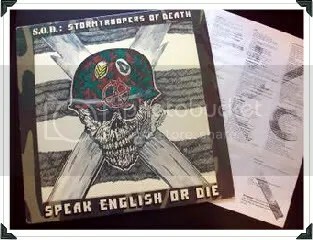 Oh man, Speak English Or Die was in heavy rotation in my house for years…Christ, even my Step-Dad knows some of the songs. You know, my folks were really cool about letting me listen to just about everything I wanted to…and they had no problem with my 80s obsession with horror and gore films. I even had my own video store membership…the one without an age restriction so I could rent all the best horror movies and watch them right in the living room while Mom was fixing dinner in the kitchen. Wanna’ hear a Canacorn fun fact? One day I was drawing the cover to Mercyful Fate‘s Nuns Have No Fun EP and my Mom came in my room…wait a sec, I want to make sure you understand what’s about to happen here. Anyway, back to S.O.D. and their 1985 ode to everyone’s favorite child molester, Frederick Charles Krueger! I can’t tell you how much the 15 year old Canacorn loved this track…And how happy the 36 year old Canacorn was to find this cool little fan made video on YouTube. God, I still know it by heart…Thanks, S.O.D.! I think it’s time to pull out my LP and give it a spin for old time’s sake. Holy crap, I forgot all about the xeroxed lyric sheet I made from my cousin’s copy! Man, I really do love this record…it’s so inappropriate, just like me.